Mercure Hotel Hannover Medical Park. Book now!Free Wifi! The 4-star Mercure Hotel Hannover Medical Park is popular with guests for many reasons, including its peaceful location on the edge of the city. All 112 rooms are air-conditioned and have free 24-hour WIFI. Use the meeting area with six rooms for your bus iness and private meetings with up to 140 participants. Take a taxi or bus from the main train station, located 4.3 miles (7 km) away, to the hotel. The airport is located 8.7 miles (14 km) away. By car, take the A2 and the A7 highways. For over 20 years the Medical Park Hannover, with its innovative companies and institutes, has been building up a successful history and is also an important location for insurers, financial service providers and other important companies. "Relax" bar & restaurant; unwind over a cool drink in a chilled setting with burgers and more. 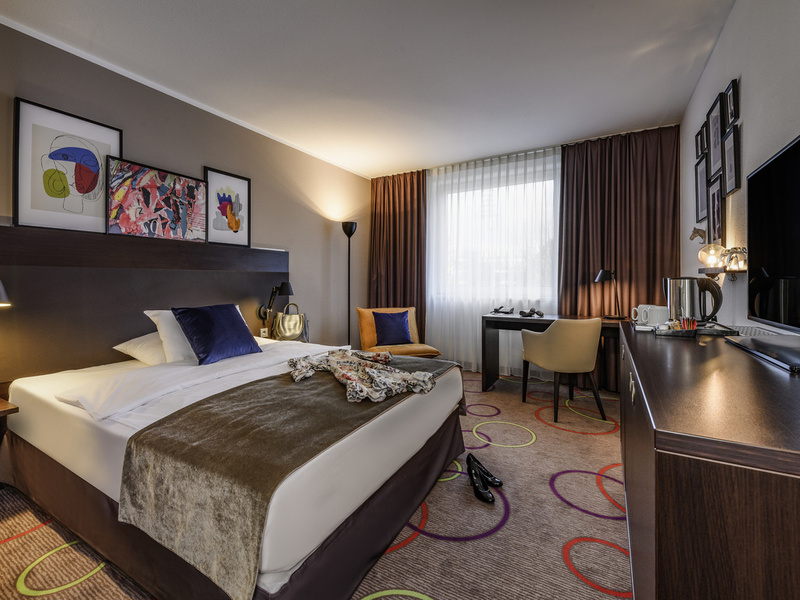 At the 4-star Mercure Hotel Hannover Medical Park, you can choose from Standard rooms with two single beds, double bed or double bed with sofa and Privilege rooms with double bed. All 112 rooms in our hotel are air-conditioned and have WIFI. Two children under the age of 12 can sleep in their parents' room at no extra cost. Children aged under 16 can enjoy breakfast free of charge. Your pet is welcome for a fee of EUR 10 a night. Enjoy a glass from our MERCURE WINE LIST or be inspired by our GIN AND TONIC selection. My stay at Mercure Hotel Hannover Park was definitely up to expectations. Staff were friendly and helpfull, the room was clean on my arrival and had everything required. The breakfast buffet was delicious. One item that was a bit confusing was the door tag to note that the sheets and towels do no need to be changed everyday. Pleasant stay in a modern hotel. Sauna could be extended with a proper gym. Welcome package for Platinum members was not provided. Always good except for airco in the room. I have a Le Club Gold card which I presented to reception on arrival. I initially did not receive my drinks voucher, and had to remind the check-in staff to provide one. Despite having a Gold Card, I was given a standard room, and was not upgraded to a Superior Room. I also notice that the points for this stay have not been added to my Le Club account, but I have this morning received an email from Accor telling me that I have successfully registered as a member of Le Club (with a Classic account and a new member number) and thanking me for my registration at the Mercure Hotel Hannover Medical Park hotel. Not impressed, especially as the check-in staff saw my Gold card when I arrived. Everyone was very courteous and helpful. The lobby restaurant was very nice and the waiters were friendly to me. The room was clean and I was able to get work done in the room. Hotel staff are very friendly and welcoming. Disappointing though as a vegetarian not to see any choice on the food menu. The stay was nice and room was clean and very comfortable as I was staying only one night. Unfortunately the TV tun on by itself at 6a.m. which was not to nice wake up as I did not need to wake up so early and the housekeeping come to my room when I was still in bed even I suppose to check out that day. That was not so pleasant morning. Overall very good. I would like to mention in particular the woman who greets you for breakfast greets you and serves you coffee quickly. I found the roomservice good - the food was good and delivered in reasonable time. The checkout was a little long - but the woman who checked me out was friendly, smiling and efficient. What puzzled me a bit was the follwing: there were two connecting doors to the next room. However, there was no way to _lock_ the door on my side. In contrast to similar setups in the US , the little lock in the middle of the knob did not lock, i.e. with only a modest technical talent the door could have been opened from the outside. The only (very basic) security was that this door had no knob in the &quot;outside&quot;. I had stayed only for a night so I can't say much. But overall I'm satisfied with everything. One small complain if I have to, they didn't provide any toothbrush or toothpastes. All staff very nice and helpful, clean room. I had dinner at the bar and the food and service was nice. The room and overall facilities were quite nice however I had to go three times with full luggage to the front desk when I arrived as the key to the room was not properly programmed. I heard several other people staying over, having similar issues. In the bathroom of the room there seemed to have a leak in the sink. I had used the sink in the night and in the next morning the floor was full of water. Good stay, comfortable beds, nice breakfast, with easy access to campus for meetings and trails for recreation. Unfortunately, you had hot water problems on the 22nd November which I understand was not your fault but I think a gesture/discount would have been appropriate in this case. would like to recommend you to provide, free still water bottle daily 1 in the room and small changes to the breakfast menu. I have stayed here regularly and never had any problems. This time, however, the Wi-Fi kept dropping and I had to resubmit the password almost every ten minutes or so. And on my final morning there was no hot water so was unable to take a shower or wash my hair.